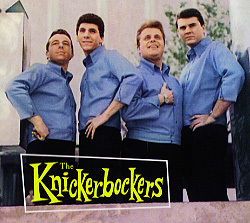 The Knickerbockers was a group that clubbed in New Jersey and New York before their producer brought them to Hollywood in 1965. There, they quickly became popular and charted their only major hit, "Lies." Seals and Crofts, Louie Shelton, Glen Campbell and Leon Russell all recorded with them, but they were never able to capitalize on the success of "Lies" on their small record label. Between 1965 and 1967, The Knickerbockers recorded at least six songs authored by Seals and Crofts, and five of them can be found on cd retrospectives produced by Sundazed Records. The Knickerbockers were definitely Beatlesque. "Sweet Green Fields" later appeared on S & C's GET CLOSER album, and it's interesting to hear this early rendition in the style of the Fab Four. "I Believe In Her" is a slow, melancholy ballad that is sung very effectively. 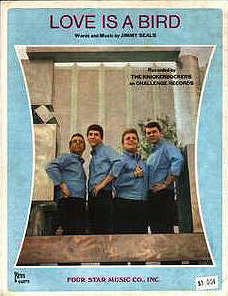 The harmonies resemble the early Beach Boys. It does not appear that S & C actually played on these particular recordings of their songs. Released by The Knickerbockers on the album, Lloyd Thaxton Presents the Knickerbockers. Also recorded 11/30/65 and released on Sundazed Record's cd, "The Knickerbockers." I'd fight the whole world just to be close to you. I'd give up other girls if I could be the most to you. And I know that I could do the things that you want done. And that I could do 'em better than anyone, anyone. If I was in the driver's seat, I'd take your heart for the wildest ride. 'Cause I wouldn't eat or sleep 'til I knew you were satisfied. And I know that I could do the things that you want done. And that I could do 'em better than anyone, anyone. 'Cause I know that I could do the things that you want done. Should there come a time and place I know that I could make you see. With just that one embrace how much you really mean to me. that I could do 'em better, that I could do 'em better than anyone, anyone. She comes to me when things go wrong, when she's sad and days are long. When she cries she runs to me. I understand, you see. For I believe in her. No one knows her like I do. Knows the things that she goes through. Just to feel that she belongs, and has someone to call her own. When her friends all let her down, she knows I can be found. That I believe in her. Released on Sundazed Record's cd, "The Great Lost Album." (1994). 04. IS THAT WHAT YOU WANT? Recorded 3/31/66 and released on Sundazed Record's cd, "The Knickerbockers." Don't you think you're standing a little too close me? This might very well lead to a catastrophe. And baby is that what you want? Don't you think you're smiling a little too tenderly? I might get to thinkin' the stars in your eyes are for me. And baby is that what you want? Is that what you want. . .
Also recorded 6/23/66 and released on Sundazed Record's cd, "The Knickerbockers." Recorded on 7/1/66 by Gene Vincent. Love is a bird. It flies where it wants to. It's hard to hang on to. Love is a bird. You're gonna get hurt if you try to cage it. You'll just enrage it. Love is a bird. An empty glass, a smoked-filled room, I find myself alone. Sun shines through the open window where the bird has flown. Yes I found a fallen angel, come from paradise. I helped mend it's broken wings, then I watched it fly. Love is a bird. It scatters its seed all around. But it likes its freedom too. Love is a bird. I can see the purple mountain, faint and almost brown. A speck so small and far away a-circlin' in the sun. Could it be the one I sheltered and held so tenderly? It seems afraid of darkening shadows, it's winging back to me. Love is bird. And it will find you. But you must be kind to. Love is a bird. Don't fly away. Love is a bird. . ..
Also recorded 2/21/67 and released on Sundazed Record's cd, "The Knickerbockers." From the album GET CLOSER (1976).